The model 38 is the "farm set" battery powered version of the model 60 (same cabinet as the 60). The cabinet is in very well preserved original condition. Four "hex" knobs. The chassis looks complete; all tubes present. Original speaker; I have no way of testing this radio. Two bands: Band 1: 520-1500 kc; Band 2: 1.5-2.4 Mc. 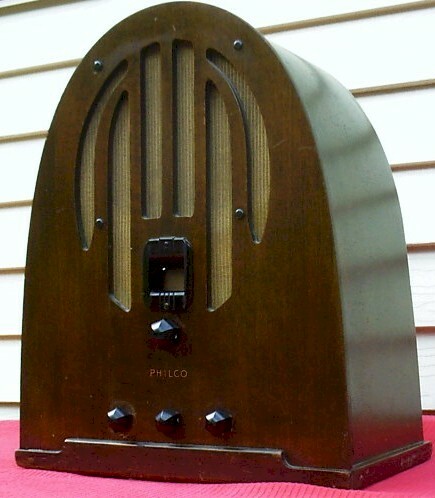 Great looking radio & a great buy! 13-1/2"W x 16-1/2"H x 8-1/2"D.
You are visitor number 2,724 to this page.